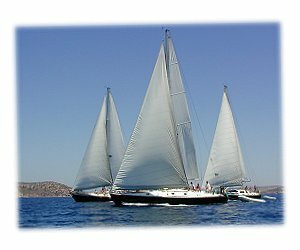 It was in 1994 in the Greek islands that our Adventure Sailing "shareboat" concept first began - from very modest beginnings with 35' rented boats! - to the present day, with our own little SeaScape family of 50' yachts. Our home is now on the small island of Leros, where our yachts live in the winter, and are based for our summer charters. Having become very much part of the family in the Dodecanese islands, it was time to spread our wings and say hello to the next-door neighbours in Turkey - where we found a very different, but possibly even friendlier culture there; the always-smiling Turkish people! And so we discovered The Turquoise Coast, with it's verdant, pine-covered forests, scattered with incredibly intact ruins, dating back to BC times - it was like like discovering a hidden treasure trove of stunning anchorages and fascinating culutre and history. Hence our Greece-AND-Turkey trips were born, and have quickly became one of our most popular options; a chance to experience both cultures in one trip - both the tiny places accessible only by sailboat, and some of the bigger, more well-known places. From here... it was thanks to our "SeaScape Alumni" that our other trips/destinations developed; "We love the whole shareboat idea, but now we want to go somewhere else !!" , they told us. So, five years ago, our first Thailand trip set sail... to explore in following years Malaysia too. Then further afield - the past 4 years have seen our SeaScape groups exploring the Kingdom of Tonga, the Seychelles, Australia and New Zealand too. Thailand is still a firm favourite (not least for the very reasonable airfares there!) - and we now revisit this tropical paradise every winter. Then we choose one other (usually new) location, to keep the tan going for the chilly northern hemisphere months! So if you're intrigued with our "Adventure Sailing" concept too - you can find us sailing out here in Greece & Turkey any time from April to October! Or for a winter escape and some other exotic sailing locales, check out where we're going this year for some much-needed winter sunshine! ...no nasty "surprises" along the way! ...much of our success comes from being a small and personal outfit. ...which is reflected in our trip prices. ...who extend their extra-warm welcome to any SeaScape sailors we bring to visit! This is our basic SeaScape "philosophy"like the sound of it? Then you'll have an absolute BALL actually sailing with us! !